Malus domestica is more commonly known as the apple tree. Inspired by the plethora and variety of apples available at the multitude of farmers markets and roadside stands all up and down New England, this shawl, with its’ solid, cushy fabric and thin bright stripes easily invokes the feeling of apple orchards on a chilly morning. This is a larger triangular shawl knit with two skeins of sock yarn, and shaped with four increases every other row, it sits nicely upon the shoulders, whether ﬁnished off with a shawl pin, or left to hang free. 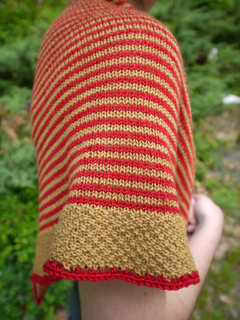 Knit all in one piece from the back of the neck to the hem, it begins with a solid triangle, moves into slightly off kilter stripes for the main body, is ﬁnished with a wide moss stitch border and topped off with a thin stripe of the contrasting color. Perfect for layering throughout the season, as summer turns over into fall, and fall sidles into winter. 437 yards/400 meters (1 skein of Cascade Heritage or a comparable sock weight yarn) of will be needed in both the main color and the contrasting color.